There are conflicting reports about whether an Israeli soldier captured by Palestinian militants has been visited by a doctor. 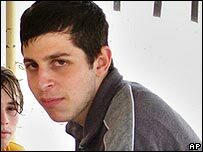 A spokesman for one of the groups believed to be holding Cpl Gilad Shalit said there was no truth to the reports. But a Palestinian official in the Fatah faction said earlier that he was stable after treatment for three wounds. Israel has rejected conditions set for information on the soldier, whose capture sparked an offensive in Gaza. The three groups believed to be holding Cpl Shalit proposed that Israel release 1,000 prisoners and end the offensive. A large Israeli force remains poised on Gaza's northern edge as mediators make last-ditch attempts to reach a solution. The head of Egyptian intelligence, Omar Suliman, is due to arrive in the region on Saturday for talks with both Palestinians and Israelis. The Israeli army said Cpl Shalit was wounded when he was captured during a raid on his post on Gaza's border last Sunday. Late on Friday, Israeli TV reported the 19-year-old conscript had been visited and treated by a Palestinian doctor. Palestinian Fatah official Ziad Abu Aen also commented on the condition of the soldier at a news conference in the West Bank city of Ramallah, citing unidentified mediators. But a spokesman from the Popular Resistance Committees told the BBC there was no truth to reports Cpl Shalit had been seen by a doctor. Abu Mujahed said the story was an attempt to get them to reveal information about the soldier "for free". The denial followed a fresh demand by the groups believed to be holding the Israeli. In a statement, the militant wing of the ruling Palestinian party Hamas and the two much smaller militant groups repeated an earlier demand for Israel to free women and children in its jails for information on Cpl Shalit. But in an additional "just and humanitarian" demand the groups requested that 1,000 "Palestinian, Arab and Muslim prisoners" be released by Israel. There was no explicit offer to free Cpl Shalit in return, but a spokesman for Hamas's military wing told Reuters news agency he would be freed in such an event. "Prime Minister Ehud Olmert has reiterated that there will be no deals," foreign ministry spokesman Mark Regev said. Israel launched air strikes for a fourth successive night against what it said were facilities used by terrorists. Palestinians said the latest strikes had hit uninhabited areas near the Khan Younis and Rafah refugee camps in the southern Gaza Strip. Relief agencies have warned of an imminent humanitarian crisis following the bombing of the main power plant. Palestinian Prime Minister Ismail Haniya denounced Israel's offensive as an attempt to bring down the Hamas-led government, and vowed it would not change its policies.